Do adults also need to wear socks in the Open Play Area? Yes, for the benefit of our crawlers and to maintain the highest level of cleanliness possible we require everyone entering the play area to wear socks. We usually have socks available for purchase for $2.00 a pair if you need them. What is your "sick" policy? 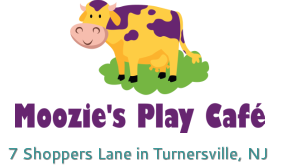 If you or your child have a cough, green runny nose or any other symptoms consistent with being "sick" we would respectively ask that you stay home to avoid infecting any of the other children playing at Moozie's. If we notice you or your child experiencing any of these symptom, we will ask you to reschedule your visit for another time when these symptoms are no longer present. We take this very seriously, please respect our effort to provide a fun, clean and a "germ free" environment for our children and yours. Is outside food permitted at Moozie's Play Cafe? Yes, we do allow outside food at Moozie's. Given the dietary restrictions, allergies and basic challenges some may have, we invite you to bring whatever snacks or meals your children may require, need or want! We have a variety of snack options and beverages available as well. Thursday evenings we are open until 8:00............ have dinner with at Moozie's. We also offer $10.00 pizzas, call ahead and we'll have your pizza ready for you when you arrive! How long is my Open Play pass good for? Are there age restrictions in the Open Play area? No, the Open Play is open to children of all ages. Children younger then 10 Months are free, we consider that a solid investment for our future! Our Open Play fees apply to children 10 months to 10 years of age. While our open play generally appeals more to children 6 years and younger, we find older siblings enjoy playing with them as well as long as they are playing appropriately. Do your Open Play Hours change? Our Open Play hours are subject to change for the following reasons: Seasonally, we make minor modifications to our Open Play hours - those hours are posted and announced via email and Facebook. Due to Weather, obviously if the weather is poor (due to snow or other unsafe conditions) we will close Moozie's for the safety of our guests and team members. We may also close Moozie's due to nice weather, if its 75 degrees and sunny most people choose to play outside. We get it, but to save on operating costs and to enjoy the beautiful weather ourselves, we may opt to close Moozie's early. Due to lack of business, on occasion we may elect to close the store if we've experienced extended hours without any guests. That usually occurs as we approach our scheduled closing time. We will announce all changes via our email club, Facebook and on our Home Page. We are a family run business, we apologize for any inconvenience this may cause you. Its always a good idea to call us if your unsure. Is Open Play included with your Classes? Yes!...... and we highly recommend arriving at least 15 minutes prior to the start of your class to allow them an opportunity to play before class begins. Is Open Play available when Classes are being conducted? Yes! however, we typically make classes available outside of our busier Open Play periods. Do we need to pre-register for all Classes and Special Events? Yes, to insure there is space for you we highly recommend you pre-register in person or on our online store. Also, classes may be canceled if their are no signs ups prior to the day of the class or event. If you haven't pre-registered on the day of the class, call before you arrive to make sure we have space available. Do your Open Play hours and Classes change? Yes, be sure to check our website for the most current hours and class times. In general we tend to make changes consistent with the change of seasons to allow for additions like Summer Camps. We also may extend our open play hours if we do not have a birthday scheduled on the weekend or if anticipated weather conditions are favorable to indoor play. We will announce those changes available via Facebook, email and on our website's homepage so be sure and check back regularly. What happens if I don't see a class for my child's age? We always encourage you to contact us regarding our classes, we aren't very strict regarding ages. In some cases it might make more sense for your child to attend a class with older or younger children. We believe in the Montessori method where children learn from one another. Give us a call and we can help determine which classes are most appropriate for your child. What happens if I cannot attend one of my scheduled classes? Please contact us prior to the start of your scheduled class. While we cannot offer refunds or exchanges, we will make every effort to accommodate you. Is your facility available for rental? Yes, please contact us to discuss the many available options. We can accommodate anything from school field trips to vendor parties. Our apologies but renting the facility for birthday parties is not permitted, please see our Parties page for the many Birthday options we have available. Give us a call for further information. May we bring cake and celebrate birthday parties in the cafe during normal open play hours? Our apologies, but we cannot permit "impromptu" parties in the cafe due to the availability of seating, concerns with cake entering the play area and the confusion it causes our other guests. Please see our Parties page for the many Birthday options we have available. Is alcohol permitted at Birthday Parties? Yes, but we ask that you bring cans or have your guests use plastic cups to avoid any accidental broken glass. We also ask that alcohol remain in the cafe throughout the party. Why do you charge a $25 outside food fee at Birthday Parties? The outside food fees covers any additional paper goods you may need as well as any additional clean up as a result. While Moozie's isn't "peanut free", we do take extra special care in the cleaning of the facility when outside foods are brought into Moozie's. Birthday cakes are not considered outside food. I'm bringing hot food to our Moozie's Birthday Parties, what time should I plan to have it arrive? ​ If your bringing hot food, we recommend you plan to have it arrive 45 minutes after your parties start time to insure its hot and fresh for your guests. You may certainly bring it earlier but understand that to insure a successful party, adhering to the party schedule is vital. We want to bring additional snacks to our Birthday Party, are there any snacks we shouldn't bring? We ask that you refrain from bringing potato chips because of the grease and Doritos or Cheetos due to the cheese, these two items inevitability end up on fingers and ultimately in the play area. Additionally, we ask that you also refrain from bringing nuts as well. While Moozie's isn't peanut free we do our very best to limit the exposure wherever possible. If you have questions about any snack, please don't hesitate to ask. Do we need to bring balloons for the Birthday Parties? Twenty balloons are provided with each of our party packages so you do not need to bring balloons. You may elect to bring a larger themed balloon that we can attach to the birthday child's seat if you like though. Are gratuities permitted at Moozie's Birthday Parties? While tipping isn't necessary its always appreciated! It's the ultimate compliment that you appreciate the services provided to you and your little ones! Why can't you hold a date for me? We get multiple inquiries a week for birthday dates. Unfortunately, unless your securing that date with a deposit we cannot hold a date for you . . . we tried in the beginning . . . it didn't go well. If your certain you'll be selecting Moozie's for your child's birthday and have some flexibility on dates and times, secure it with a deposit - we will allow you to move the date, assuming its available. Do you provide Moozie themed invitations? Yes, fifteen are included with each of our party packages. If you need additional, they are available for $1.00 invitation. Just remember we have a 22 child maximum for our parties so as not to exceed our maximum occupancy. I'm unable to attend a special event that I paid for, what do I do? Let us know as soon as you know you are unable to make it. We keep our events small and intimate so we sometimes have a waiting list. The more advance notice the better (typically a minimum of 24 hours). We will reach out to those guests on your behalf and if we are successful we will provide you with a credit towards a future event. Sorry, we do not provide refunds or credits the day of the event. For some of our events, we offer snacks - the events description will say snacks provided. We will also offer pizza slices for $1.00 for events that take place during lunch and dinner also.